Every day we have a choice about what to put into our bodies. And yah sometimes I need some mofo Sour Patch Kids or some real pizza. But 80-90% of the time, you want to be eating to manage inflammation and also for longevity. The foods we eat turn can Cancer genes on or off (epigenetics), and can either cause inflammation or keep it at bay. Managing diet is imperative for those with chronic inflammatory conditions such as myself, but is also of great important really for everyone. So what dietary choices lead to inflammation? Really anything that the body doesn't recognize as food. When the body perceives a foreign agent (such as chemical dyes in processed foods), our system of antibodies attacks that agent, but also the cell tissues around it. When this happens repeatedly, the body is in a constant state of fending off attack - and this leads to chronic inflammation. Inflammatory foods vary from person to person. In general though, anything chemical and anything processed will affect everyone ostensibly the same way. But those experiencing chronic inflammation seem benefit from eliminating sugar, dairy, processed sodium and even grains. I actually discourage a grain-free diet if you don't experience inflammation after consumption, because small amounts of high-fiber grains like wheat berries, brown rice, and buckwheat can have a beneficial impact on the cardio-vascular system. I myself have been minimizing grain consumption - particularly wheat - because I do experience a direction connection between wheat consumption and joint pain. I've replaced breads and bagels with grain-free almond-flour based Barely Bread. And have replaced tortillas and wraps with Siete Foods grain-free tortillas and tortilla chips. I've also increased my consumption of bovine collagen to support my joints, AND have experienced the added benefit of younger looking skin, thicker hair and stronger nails! 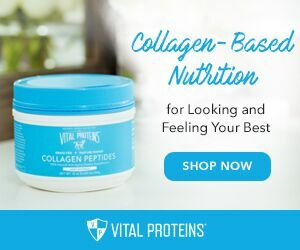 For those of you who are new or newer to my blog, my obsession with Vital Proteins Collagen Peptides runs very very deep. After a few weeks of consistent use, the collagen turned back the block on my skin and also gave me hair thickness the likes of which I haven't seen since my late 20s. And when Vital Proteins launched their Collagen Creamer last year, I fan-girled all over the place because it was the best thing to happen to coffee EVER. The Vanilla Collagen Creamer is my favorite, but when I got the idea for a grain-free, no-sugar bread pudding for a chilly winter day, my heart was saying "Gingerbread girl." I totally winged this recipe - my usual MO - and not only does it taste so good, but by subbing Lakanto zero-glycemic monk fruit sweetener, this recipe is paleo-friendly, wheat-free, grain free, and won't make your blood sugar go on a joy ride. I always use Vital Farms eggs because they're pasture-raised. This means that you get ANTI-inflammatory Omega 3's, without the inflammatory Omega 6s you'd find in commercially raised eggs. Seriously, buy Vital Farms eggs if you have access to them because they raise the chickens humanely so you're doing everyone a favor. And I used MALK Organics unsweetened non-dairy almond milk. MALK Organics nut milks are dairy-, soy-, gluten-, GMO- and lactose-free and vegan friendly. No inflammatory carrageenan or binders. No colors or sweeteners Mother Nature wouldn’t recognize either. Their formula is six ingredients or less depending on the milk, and there's more than one cup of sprouted organic nuts in every bottle. - Preheat oven to 350 degrees, and spray 6 mini casseroles or 1 large baking dish with Ghee Oil. - Cut the Barely Bread bread into 1/2" cubes. - In a small saucepan, heat the MALK until simmering. Remove from heat and whisk in the ghee, monk-fruit sweetener, Gingerbread collagen, and the vanilla bean paste. Set aside to cool to room temperature. - Once the mixture has cooled, whisk in the 2 beaten eggs. - Toss the Barely Bread cubes and the mixture in a large bowl. Let sit 5 minutes, and toss again until the mixture has evenly coated the cubes, and has absorbed. - Distribute the coated bread cubes between the casserole dishes, or in the large baking dish. I recommend placing the mini casseroles all together on a baking sheet to make them easier to put in and pull out of the oven. - Bake at 350 degrees for 30-35 minutes until the custard has set. - I served mine with coconut labneh, and a grating of fresh tangerine peel!